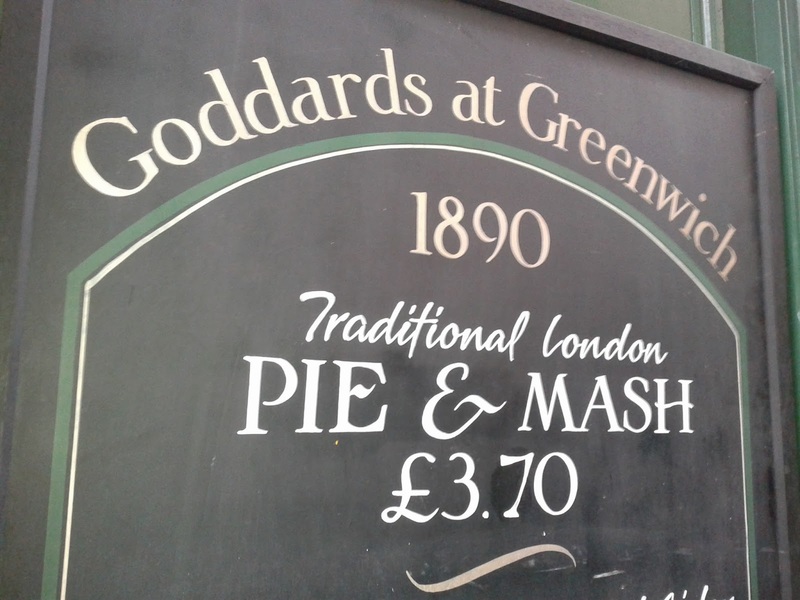 Goddards are an important name in the history of London Pie & Mash shops. They have been suppliers of pies to various establishments for a long time as well as having their own shop in Greenwich. They recently moved to new, bigger premises along King William Walk and a couple of Pierateers thought it was about time to pay a visit. After exiting from the hustle and bustle of nearby Greenwich Market my first impressions were very good. There were at least 10 signs outside the shop which said the word ‘PIE’ so we knew we were in the right place. The shop had been done up very well with attractive green livery in a new, old fashioned style. Upon venturing inside, we found it was very quiet, probably because it was a bit early for lunch. However, it is never too early for pie and an 11am pie is nothing unusual for a Pierateer. It was good to find that it is never too early for pies at Goddards, they seem to sell pies all day long. The inside of the shop had classic pie and mash shop features. The walls were covered in white tiles and narrow wooden booths were fixed to the wall. These seemed very inviting, like they were asking you to slide in (with a pie in one hand of course). Despite having been recently converted it looked like the shop had been a pie and mash shop for years. When we came to order it became apparent that this wasn’t just a standard pie and mash shop. Traditionally they just serve shallow minced beef pies which are shortcrust pastry cooked in a pie dish. I don’t know quite how they are made but there is something about these pies which is different to any other pies, particularly the pastry. The tradition dictates that there is also builders tea available as well as jellied eels (the pies were originally filled with eel). The pies must be served with mash and liqour (a kind of parsley sauce). I am a great believer in tradition but the modern pie lover can be quite discerning. As we have demonstrated at Pierate there are so many pies available on the market. This array of choice and completion has forced Goddards to expand it’s range. They have a range of pies, puff pastry, quite tall and in an array of flavours. It was ins-pie-ring as we looked over the counter to see such a sea of pies to choose from. They also sell such modern things as caffe latte, which you wouldn’t be able to get in some Pie & Mash Shops which try and be more traditional. But with Costa Coffee attempting to take over Britain it is clear that it is futile to resist the desire of modern consumers for their hot, milky coffee fix. Both of our reviewers took the op-pie-tunity to accompany their pies with lattes, as if the pie wasn’t already calorific enough (we call this healthy combination: "pie-lattes"). The choice of how to have your pie and mash was quite dazzling simply by varying the quantities of the two basic components of the meal. You could have pie and mash, double pie and mash, pie and double mash or even (would you believe it) triple pie and mash. 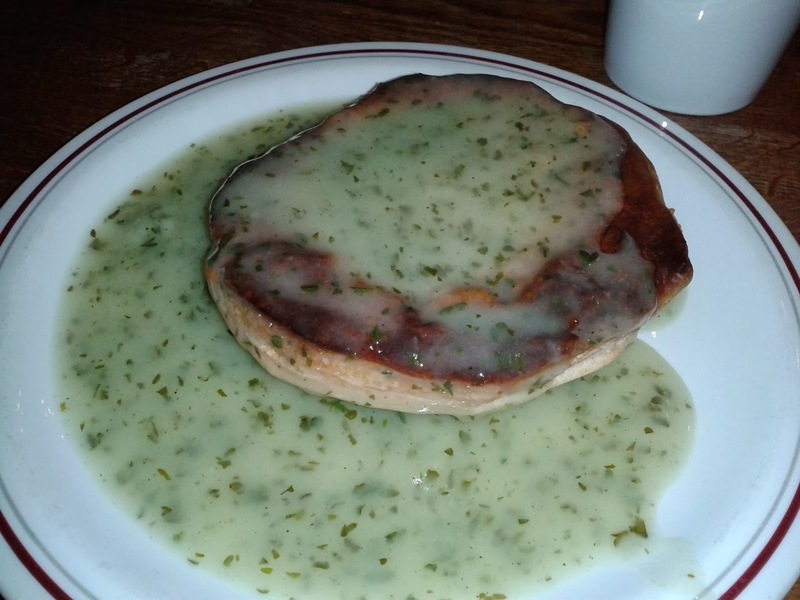 Is triple pie and mash something that one person is supposed to eat? Neither of us felt up to that particular challenge (although perhaps another time!). There is even the option of the ever popular pie, mash and eels. Pierateer SJL went for the Traditional Minced Beef pie & mash shop pie with an Apple pie for later. 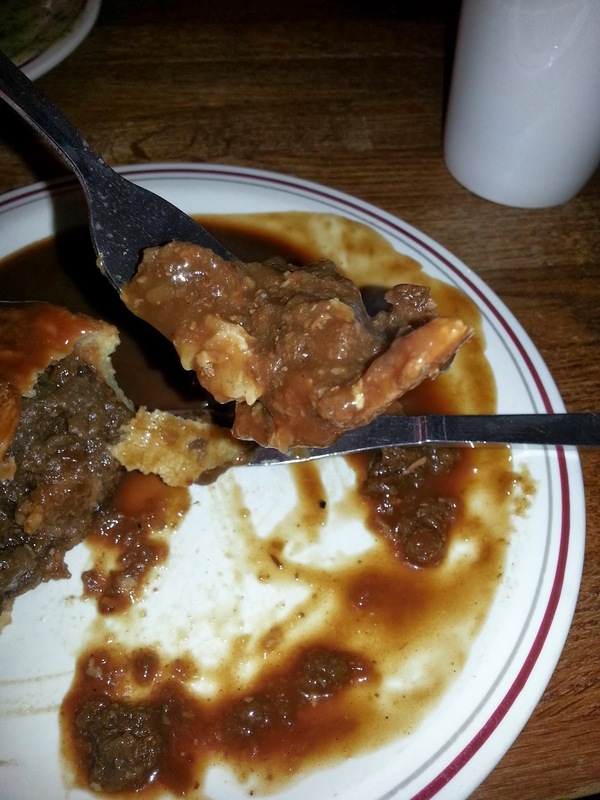 Pierateer TJP decided to see how the Steak and Ale pie fared compared to the competition. 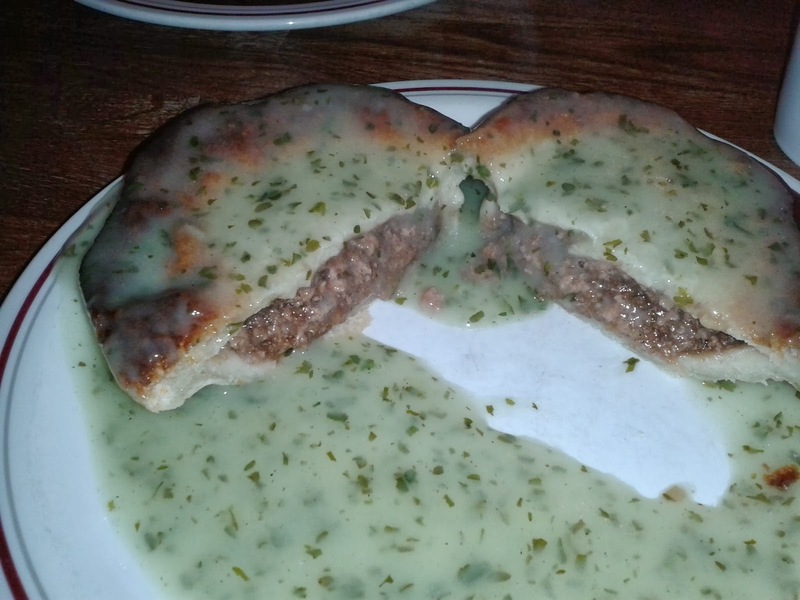 This pie looked the part, the classic, traditional shape afloat on a sea of parsley liquor. It was in good condition except a touch too much carbon to the upper surface. The sauce did a good job of covering this though. The liquor seeped into the very being of the pie making it hard to tell where one began and the other ended. I just can’t get enough of this particular parsley sauce which I think is why I am such a lover of these quaint establishments. In this case the parsley in the liquor was a bit dry, but it is just the pie which is being rated here. The pastry was soft on the outside with a bit of hardness in the middle. Ordinarily this could be quite a good combination but it seemed to not quite work in this instance because this pie was pretty cold upon serving. This left the pastry seeming overly Chewy. The filling was decent, a meaty flavour which certainly pleased my tasted buds. Plenty of gravy meant quite a liquid consistency but it wasn’t wanting for lack of mince. It was sans air gap which is always good to see, but badly needed for this pie, being of the shallow variety. At just £3.70 for pie and mash in a London pie establishment this was very Cheap compared it to the modern equivalents such as Square Pie which will set you back around £6. At the end of the day, that is what these are, a cheap working man’s pie and it was a decent effort. I would get it again if only I could be sure that it would be warmer next time as this sadly left me feeling cold to Goddards Pie & Mash. I had the steak and ale pie. 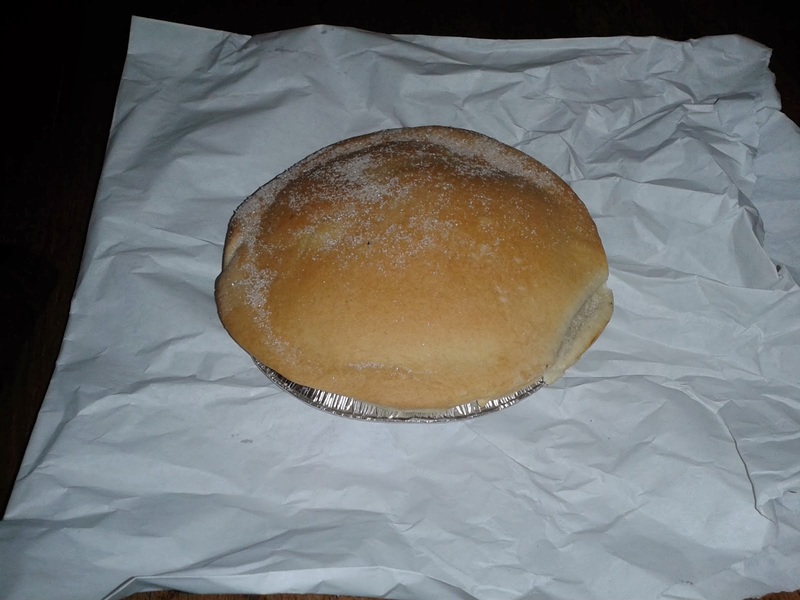 Costing £2.70, the pie was cheap for eating in. It arrived in good condition, topped with a nice smooth covering of silky gravy. However, the top of the pie did look a little over-browned, as you can see in the part of the little not covered with gravy. Upon opening the pie for a cross-sectional view, I could see that the pie was packed to capacity with very little airgap. By this point, the lid of the pie had gone a little soggy with the gravy and therefore a bit chewy. I've found that some pies are able to hold their crispiness well even in the presence of gravy, but this pie seemed to struggle a bit here. Despite this, the pastry still seemed to be good quality. I could also see some good chunks of steak within the content. As with any pie, the truth is in the eating. As I ate this pie, I couldn't help noticing a rather strange texture. I think this photo documents the texture of the pie quite well - especially the bits of content lying loose on the plate at the bottom of the picture. It was almost...jammy. Like how I'd imagine steak jam to taste and feel. For me, this was a bit unappealing and lost the pie marks. I left some of the jammy bits behind on the plate after finishing the pie. Overall, this pie is a decent price, with decent quality of pastry and is packed almost to capacity, but the content of the pie let it down. 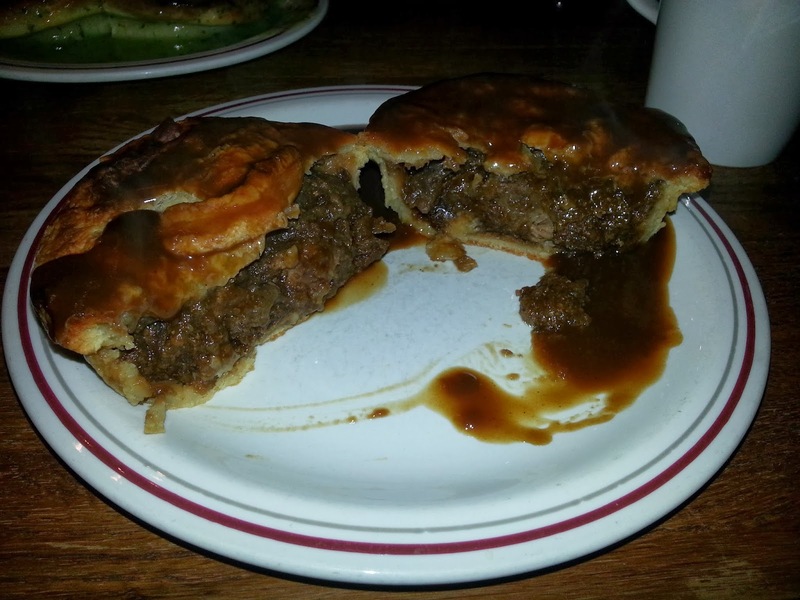 The consistency and texture of the content wasn't quite like anything I'd experienced before with a steak and ale pie. The apple pie at Goddards was unlike any that I have ever had before. 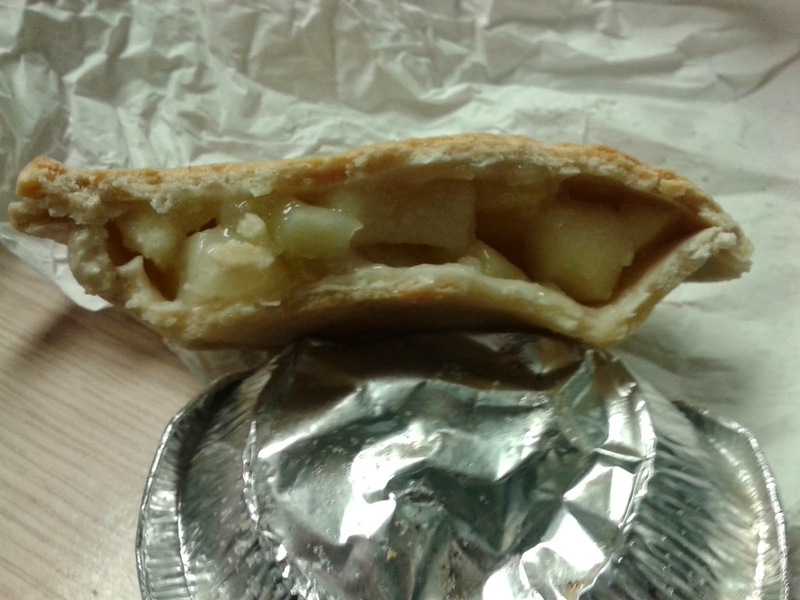 The filling was your standard chunks of apple in a sweet sauce but the pastry was hard and a bit salty in places. However, it wasn't hard in a way which made the pastry dry, just a bit firm to the bite. It was quite nice actually in terms of texture as it gave you something to sink your teeth into. The saltiness wasn't strong and didn't detract from the balance of flavour. The apple was good, it maintained plenty of firmness and was in satisfyingly big pieces. There wasn't too much sweetness but plenty of flavour. It was a nice brown Colour, dusted in sugar although strangely smooth in appearance. The Capacity could have been bigger as this was a fairly shallow pie but for £2.30 to eat in with custard or ice cream this was very Cheap, especially for London. It worked well even though I chose to have it without any additional custard or ice cream which is the sign of a good apple pie. 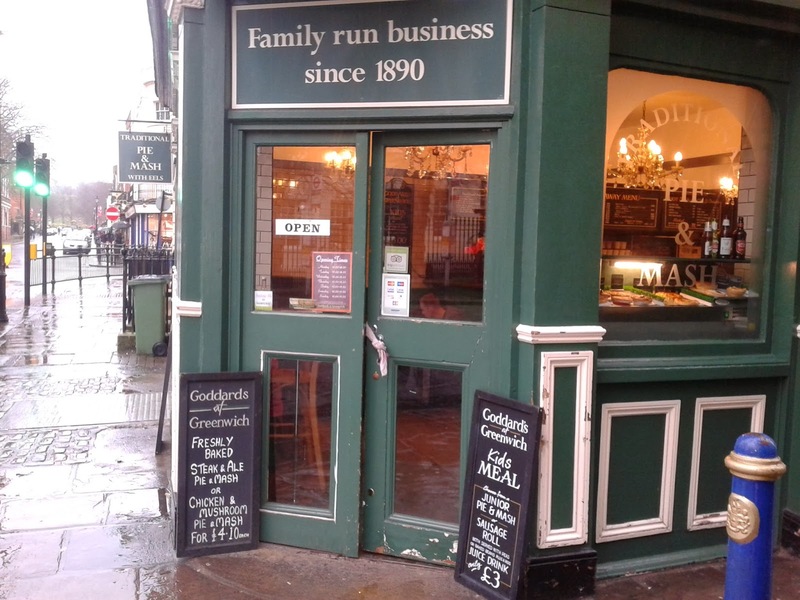 So a bit of a mixed bag from Goddard, it was worth the visit to see how this famous name fared and the restaurant certainly felt the part of a traditional pie and mash shop. However perhaps that is just it, this is in quite a touristy area and while we were there it was mainly tourists who came in. 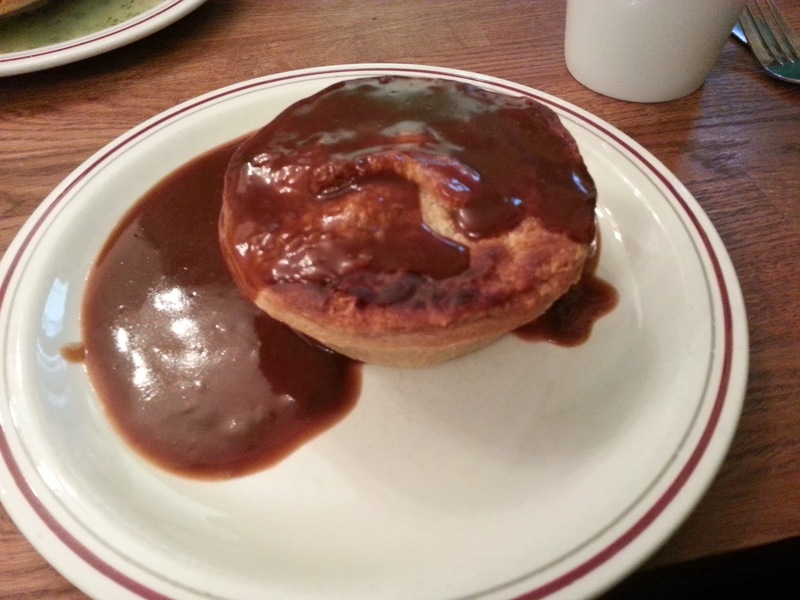 The pies are not bad and there is an impressively big range but in our opinion we think you can get better traditional pie and mash elsewhere.